Comes with lifetime support and updates. (For the lifetime of the product—not your lifetime! 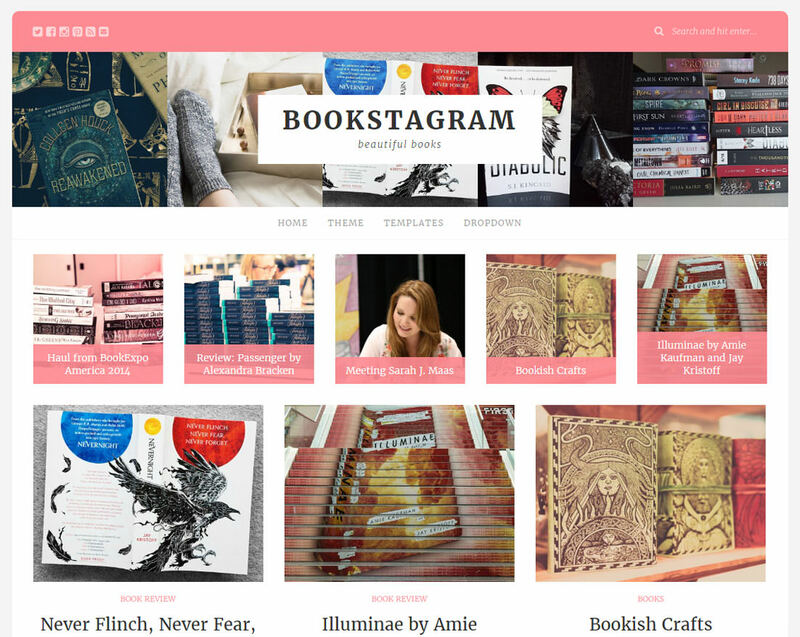 The Bookstagram theme is designed to help you showcase your gorgeous bookish photography. The header is an automatically updating Instagram feed all on its own. It will update every few hours to always display your latest bookstagrams. The preferred blog post display (2 column or 3 column grid) also puts a focus on your photography, with large image thumbnails. Typography settings for: site title, site description, post titles, widget titles, headings (h1, h2, h3, etc.). Announcement bar text/colours (appears above navigation). “Page” settings: show feature area (checkbox), show left sidebar (checkbox), show right sidebar (checkbox). “Comment” settings: show form above/below comment list (radio), text to insert before comment form (text box), text to insert after (text box). Social media profile URLs (for display in the top bar). 4 widget areas including: left sidebar, right sidebar, below posts, footer widgets. 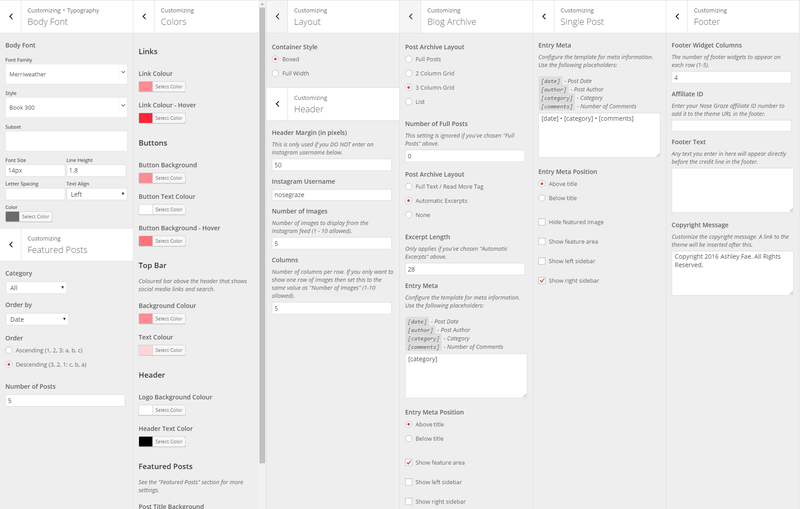 Support for plugins including: MailChimp for WordPress, Naked Social Share, and Expanding Archives. Supports multiple navigation menu levels. Responsive design to look gorgeous everywhere. Translation ready — translate the theme into your language. Automatic updates delivered inside WordPress. Support and documentation to help you get set up. This theme will ONLY work on self-hosted WordPress blogs. It does not work on Blogger or on the free WordPress.com platform. Fix: Instagram feeds not updating. Tweak: Featured area will not display if number of posts is set to "0". Announcement text colour now applies to links as well. Top bar text colour now applies to search box. Updater script now works on older versions of PHP. Ensure site title is centered. Fixed default font style on site description font. Added a filter to allow shortcodes in widgets. Added support and templates for the Novelist plugin. Fixed a few typos in PHP comments. Updated Font Awesome to version 4.7. Enhancements to allow custom post type archives to display as expected. Search bar placeholder text now uses the correct text colour. Button hover colour now works correctly. Replaced a few incorrect text domain strings with the correct one. Fixed a problem with the announcement bar colour settings not saving. Added new widget area directly below the navigation. Ideal for banner ads. Removed bottom margin from announcement text. Added more space between posts when using the Full post layout style. Added margin above the mobile "Menu" button. Featured Posts bar no longer shows posts that don't have a thumbnail. Header now has zero padding if an image is uploaded. This allows the image to stretch to the edges if it's wide enough. Fixed compatibility issue with PHP versions less than 5.5.